A group numbering dozens attacked the opening of several art galleries on Tuesday night, putting at least five people in the hospital with injuries from pepper spray, broken bottles, batons and knives. The hospitalized included one Polish and one German citizen. The attack was first believed to have been in response to art pieces on exhibit because Galeri Non had an exhibition by the collective Ekstramücadele (Ekstrastruggle) that featured content on the taboos of Islam and Atatürk both. However, witnesses at the scene who spoke right after the incident and the following morning confirmed that the scuffle broke out due to alcohol consumption in the streets. After the incident, neighborhood residents claimed gala visitors had been harassing and disturbing other people in the street. One person also said the gallery owners had been told previously that their guests were disturbing neighborhood residents. More comments from locals in the media on Wednesday focused on them being disturbed by not only the art galleries but also the apart hotels and alcohol-serving restaurants that have multiplied in the neighborhood in recent years. As well, locals said they were disturbed by people drinking in the streets due to the smoking ban. However, the restaurants and hotels are also perceived to have a negative effect on morals, according to various comments offered to the media or stated on the Internet. The attack took place in Tophane, a gentrifying neighborhood in Beyoglu that is home to newly renovated art galleries and restaurants in addition to traditional (men-only) tea houses and residences of migrants who moved into neighborhood from more conservative Anatolia in the past 30 years. Tophane, like much of the rest of Beyoglu, is home to a hodgepodge of residents from diverse backgrounds who hold several different viewpoints. No one is sure how organized the attack was or what the motivation, but it has led many to claim the incident should be viewed in terms of the neighborhood's ongoing gentrification and the inevitable clashes of values and basic attitudes that have accompanied the neighborhood's transformation. Though Tophane is viewed as a conservative neighborhood -- and after this attack, will likely be viewed as an even more conservative neighborhood (Islamic fundamentalist?) -- it is likely the the gentrification process will continue. The question is whether the neighborhoods residents can learn to live with each other in a spirit of tolerance and respect for difference. Sure, the art-going crowd should watch their volume and perhaps not go onto the streets with glasses of wine in mid-daylight if it is offensive to the neighbors, but surely violence is not a solution and might there not be some give and take on both sides? All of a sudden that does not seem a question for Tophane alone . . .
Democracy and difference is hard to be sure. The first mass in 95 years was held at the Surp Hac (Holy Cross) Armenian church on Van's Akdamar Island yesterday despite a controversy this week about the cross that church officials wanted to place atop. The church was first opened as a museum two years ago following a Turkish government funded restoration, after which a Turkish flag was placed at its top. 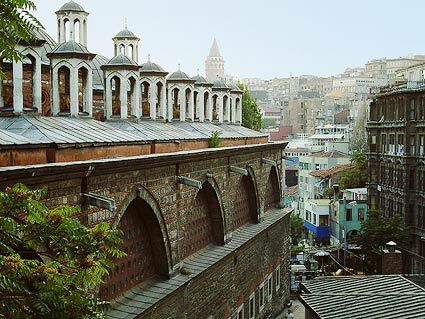 Culture Minister Ertegrul Gunay announced in April that the church would be open for prayer once a year. In expectation of the first mass, the Turkish Armenian Patriachate built a 100-kilogram church, which it had planned to place atop the church with the help of for experts from Armenia. However, municipal authorities objected to the cross, arguing that church officials did not have proper permission from the Van Chamber of Commerce and Industry. 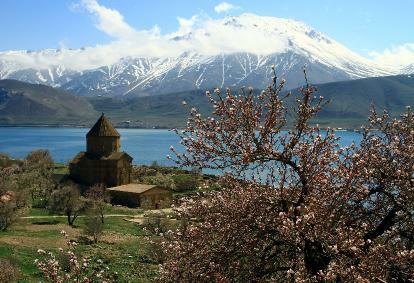 Given that the church has been open for two years and that the government had plenty of time to address the issue, the cross controversy evinces the difficulties that remain in both Turkey's reconciliation with its Armenian minority, as well as its relations with Armenia and the Armenian diaspora. “This is a very important step for this city and the people living in the city,” said Nalci, who came early to Van to help publish a special edition newspaper in Armenian called “Van Time,” the first Armenian-language newspaper to be printed in the city since 1915. “Five years ago, you couldn’t imagine that a newspaper in Armenian would be published in Van. Previously people here would tell me not to say that I’m Armenian. Now people here are proud to say they have an Armenian friend,” he recounted. “This is a big opportunity. It’s a big step for the Van people,” Nalci added. After heralding the open as a major accomplishment in Turkey-Armenia relations, why the Turkish government did not take a stronger position on the cross remains to be seen. High-ranking government officials did not attend the ceremony, though the government has said that the mass will not be the only one to be held at Akdamar. 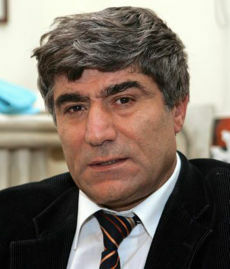 The European Court of Human Rights (ECHR) has found Turkey to have violated numerous human rights both before and after the assassination of Turkish Armenian journalist Hrant Dink. Dink was assassinated in January 2007 and the investigation that has followed has been tainted by a series of cover-ups and serious judicial mishandling. (For background, click here). The Court found Turkey to have failed to protect Dink's right to life and freedom of expression, as well as to have fallen short of its obligations to provide for an effective investigation of his murder. In the weeks, months, and years after Dink's murder, numerous high-ranking state security officials and police have been implicated as either falling far short of their duties to protect Dink, at best, and at worst, actively conspiring with Dink's murderers. During its defense at the ECHR, Turkey argued that Dink did not fear for his life or else would have asked for private police protection. A recent book by journalist Nedim Sener, who this year escaped criminal charges brought against him in relation to a book he published revealing details of the Dink murder and subsequent cover-up, alleges that security officials warned Dink of threats to his life before the assassination. Security officials have denied such knowledge. The Turkish Foreign Ministry has said it will not appeal the court's decision. It is yet to be seen whether Turkey will provide for a remedy to its previous failure to effectively investigate Dink's assassination.